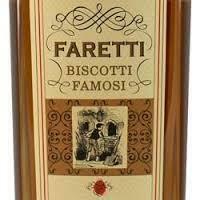 Farretti Biscotti Famosi liqueur is made in the Trentino region of Northern Italy where they still bake their biscotti cookies in rustic brick ovens. Sounds like a hidden part of heaven I've yet to find. Just like the traditional twice baked cookie, this liqueur's recipe is based off of nuts, anise, citrus and caramel. The base is of vodka and it is sweetened with beet sugar. I'm not sure how this liqueur is crafted because there isn't much on the web, but it genuinely tastes like liquid biscotti. If you are a pastry chef or a barista this bottle needs to be on your radar. However, you don't have to be a professional to enjoy Faretti. If you like biscotti with your coffee, but don't always have a batch handy, try adding an ounce or two to your coffee for a fix with a kick.